The leaders of Russia and Turkey have agreed to establish a de-militarised zone in Syria’s Idlib province, in a move that ostensibly puts on hold a threatened all-out assault by government forces on Syria’s last rebel bastion. He added that heavy weapons would be withdrawn from all opposition forces by October 10 – an approach supported by the government of Syrian President Bashar al-Assad. Erdogan said both his country and Russia would carry out coordinated patrols in the de-militarised zone, and reiterated that the biggest threat to Turkey was the Syrian Kurdish People’s Protection Units (YPG), who control swathes of territory in northeast Syria. Following the press conference, Russian Defence Minister Sergei Shoigu said that the agreement between Putin and Erdogan meant that no military action would be taken against Idlib, according to Russian news agencies. The joint action plan comes hours after Putin and Erdogan conducted bilateral talks behind closed doors. Prior to the meeting, Erdogan said cooperation between the two countries would bring “hope to the region”. Al Jazeera’s Rory Challands, reporting from Russia’s capital, Moscow, said the agreement meant that the looming all-out offensive had been put on hold. 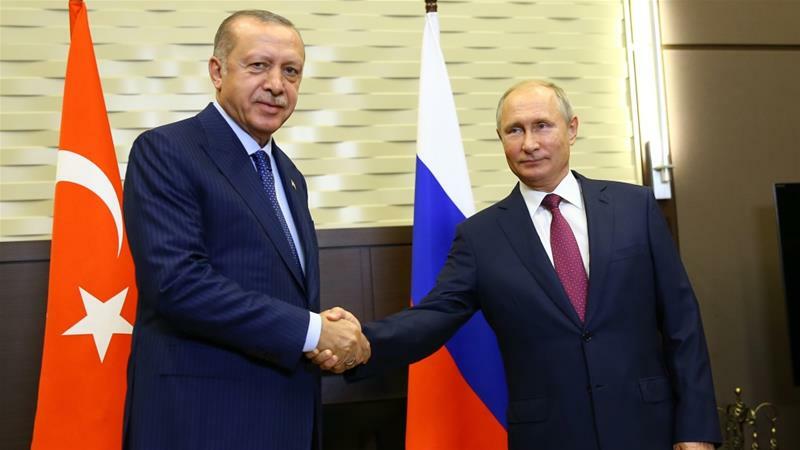 “Essentially this boils down to a fairly significant diplomatic success for Erdogan as he has been voicing his strong opposition for some time now to the assault on Idlib,” Challands said. The Syrian government had recently announced plans to launch a major military offensive on Idlib province, long controlled by various armed opposition groups and their last bastion in the war-torn country. Since the beginning of September, dozens of people have been killed and injured in air raids and attacks by the Syrian government and Russian fighter jets, according to activists on the ground. Russia and Iran, who back the Syrian government, want to eliminate what they call “terrorist groups” in the province, which neighbours Turkey. Ankara wants a stable ceasefire in the region to disarm these groups while keeping the peace in Idlib. The United Nations has warned that a full offensive on Idlib would lead to the “worst humanitarian catastrophe in the 21st century”. On Friday, thousands took to the streets across Idlib, home to an estimated three million people, to protest against a potential full-fledged offensive by government forces and their allies.